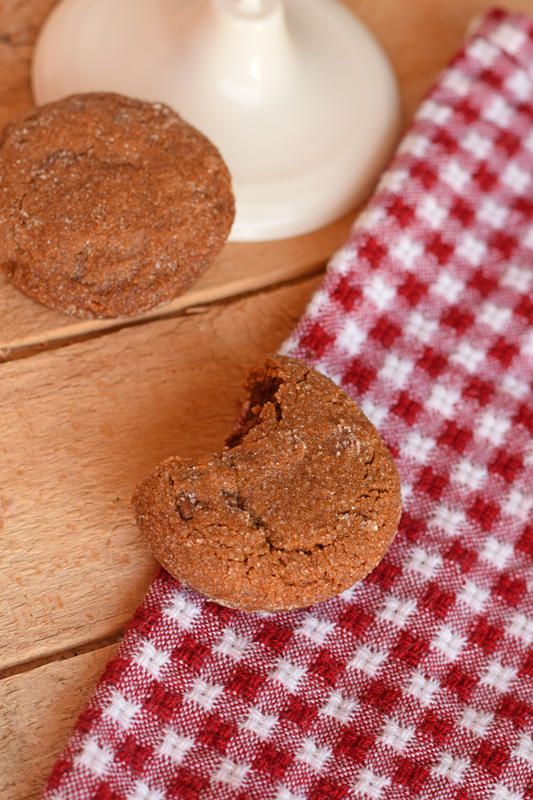 These Double Ginger Molasses Cookies are a delicious way to kick off the fall season! Thank you to OXO for providing the kitchen tools for this post. In our house, fall isn’t the start of football season. It’s the kick-off to baking season! My family loves when the weather starts to turn cool because I get the itch to bake. From eclairs to cakes to breads, I always have a baking surprise up my sleeve! I enjoy baking and gifting treats to others, as well. During the holidays, I typically make cookies to send to neighbors and other friends. This Double Ginger Molasses Cookie recipe from Dorie Greenspan is our new favorite. My family has been “taste testing” them to see if they are good enough to give as treats this year. From the sneaky, chocolate-y grins on the kids’ faces, I may have to do all my holiday baking this year after they go to bed. Otherwise, the cookies may never make it into the treat boxes! 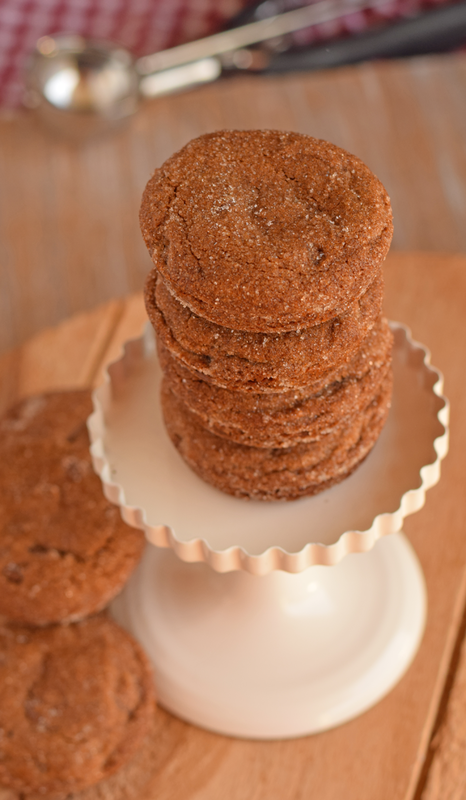 These Double Ginger Molasses Cookies have a unique softness to them. The flavor is warm and reminds me of a fall morning spent under a blanket with a book in hand. Take this recipe to your cookie exchange party, and you’ll be the hit of the gathering! Whisk the flour, cocoa, espresso (if using), spices, baking soda and salt together. 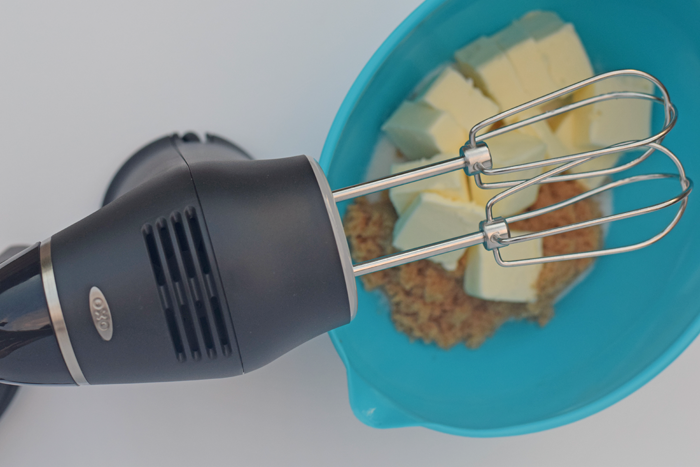 Working with the OXO Illuminating Digital Hand Mixer, beat the butter and both sugars together on medium-low speed for about 3 minutes, scraping the bowl as needed, until fully blended. The OXO Illuminating Digital Hand Mixer is excellent for mixing, especially at night time. The mixer headlight stays on for as long as you are mixing the batter, allowing you to reach the perfect batter consistency. Add the yolk and beat for 1 minute, then add the molasses and vanilla, beating until smooth. Turn off the mixer, add the dry ingredients all at once and pulse the mixer until the risk of flying flour passes. Working on low speed, mix the dough until the flour is almost but not completely incorporated. Add the crystallized ginger (or the sugared fresh ginger) and chocolate and mix until the dry ingredients disappear into the dough and the ginger and chocolate are evenly distributed. 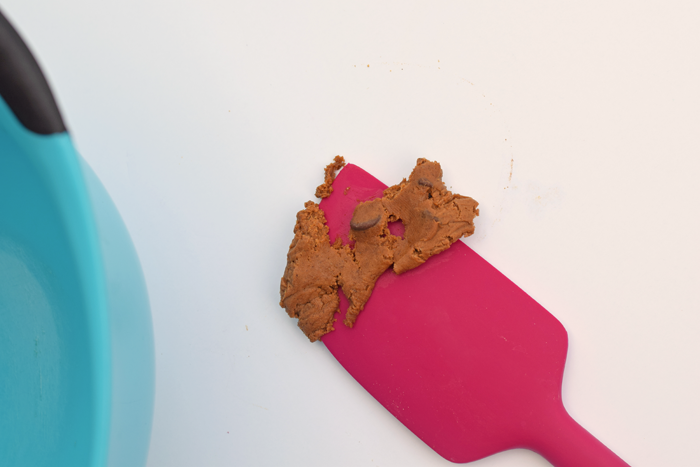 If you’ve got bits of dry ingredients on the bottom of the bowl, mix them in with the OXO Medium Silicone Spatula. This particular spatula is heavy duty yet soft enough to easily scrape down the sides of the bowl. Gather the dough into a ball, flatten it and wrap it in plastic. Refrigerate for at least 2 hours. The dough can be refrigerated for up to 3 days if needed. Getting ready to bake: Position the racks to divide the oven into thirds and preheat it to 350 degrees F. Butter or spray the OXO Non-Stick Pro 12 Cup Muffin Pan. Have the OXO Medium Cookie Scoop at hand. 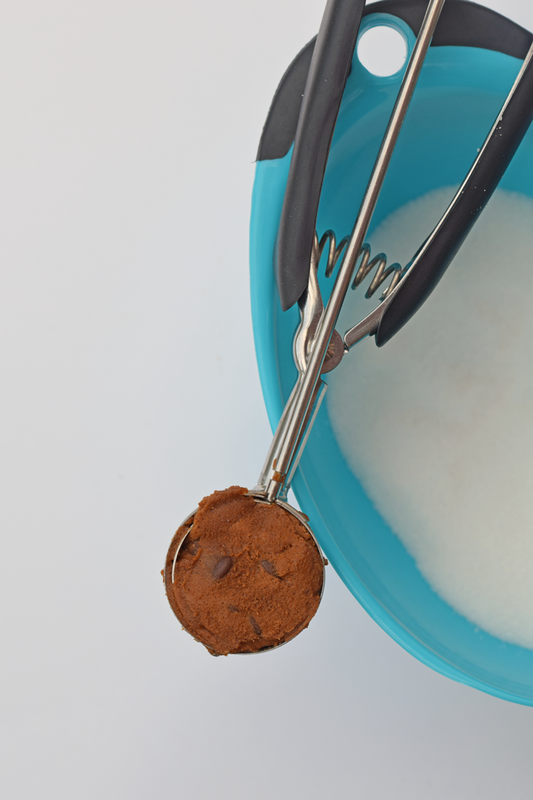 Alternatively, you can use a rounded tablespoonful of dough for each cookie. If you’re using tins, find a jar or glass that fits into them and can be used to flatten the dough; cover the bottom in plastic wrap. Spoon some sugar into a wide shallow bowl. 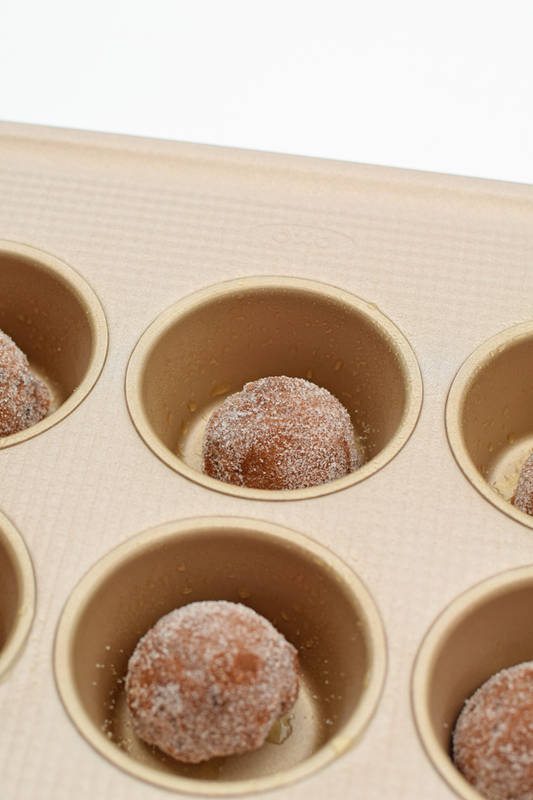 For each cookie, mold a scoop or spoonful of dough into a ball between your palms, then turn it in the sugar to coat and put in a muffin cup. If using tins, use the jar or glass to flatten each ball until it almost reaches the sides of the cup. This was my first time ever making cookies in a muffin pan. I liked the technique so much that I will probably use it each time now! This method led to perfect consistency cookies. 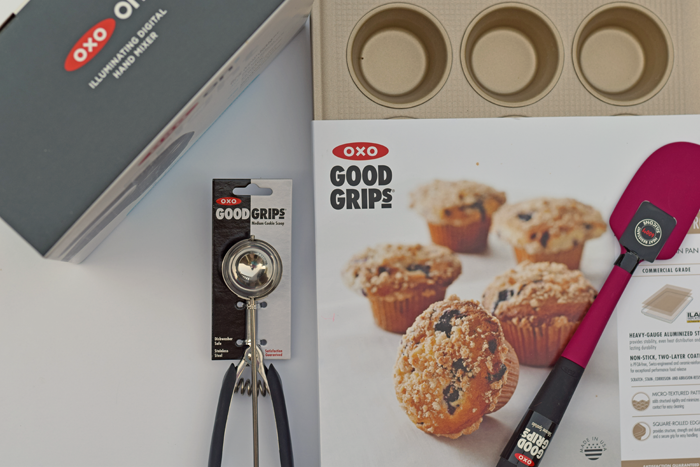 The OXO Medium Cookie Scoop made sure that each cookie was the same size, and the OXO Non-Stick Pro 12 Cup Muffin Pan ensured cookie baking perfection! Bake the cookies for about 13 minutes, rotating the tins or sheets top to bottom and front to back after 7 minutes. The cookies should be lightly set around the edges and softer in the center. Transfer the tins or sheets to racks and let the cookies rest for 15 minutes before unmolding them and/or placing them on racks to cool completely. If you’re baking in batches, make certain to start with cool tins or baking sheets. Once baked, store the cookies in an airtight container for up to four days. Although, I seriously doubt if they will hang around that long! I’m happy to be posting this cookie recipe today, not only because it’s a delicious treat, but also because of the cause that it is supporting! As a sponsor for Cookies for Kids’ Cancer, OXO is donating $100 to the cause for this post. After my little man’s battle with cancer last year and ongoing check-ups, this is a cause that is very near and dear to my heart. Interested in getting involved with Cookies for Kids’ Cancer? Visit the Cookies for Kids’ Cancer website, and check out how to host and register your own bake sale for the cause! These look fantastic! And, YES, what a fantastic cause! I’ve never tried any molasses cookies before, but these are now on the “try” list! Such a great cause and these cookies sound amazing!! I’ve been craving molasses cookies lately. Yum!